I’m always looking for a challenging walk but find that many self-guided walks offered by the hiking companies are not tough enough for me. Since you always get thrown out of your hotel after breakfast, you need a good few hours walking if you’re not going to arrive at your hotel too early. My perfect walk keeps me occupied most of the day and finishes about an hour before dinner – just enough time to grab a beer, have a quick shower, and then settle down to dinner. 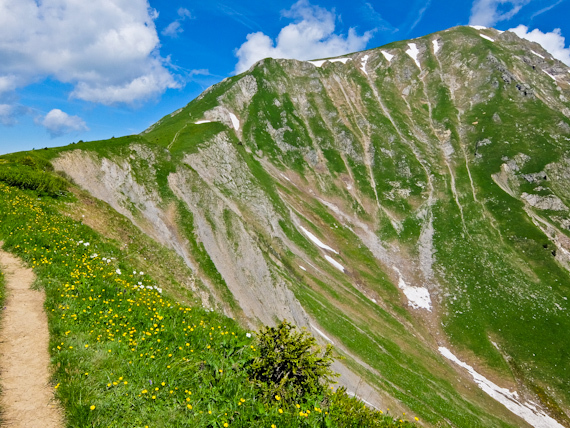 One of the most demanding is walking the High Alps in France and I fly to Geneva with my partner to tackle it. From Geneva it’s around an hour’s transfer to the village of Les Gets, the starting point, and I’ve been warned that every day I will be expected to cover over 20km, with some strenuous climbs and descents. Fortunately, my baggage will be transported between hotels. 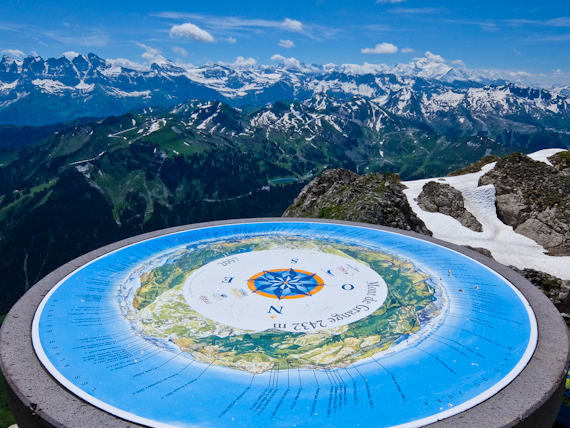 The Chablais region is sandwiched between Lake Geneva and Mont Blanc and straddles both France and Switzerland and indeed some of my path will follow the smuggler’s paths between the two countries. It’s a mosaic of colourful Alpine meadows, mixed woodland and glacial tarns, crowned by dramatic rocky mountain peaks and surprisingly most of it is hardly frequented by walkers. Les Gets is a mecca for mountain bikers and I spend most of my first day trying to avoid being run down by them as I climb steeply up to Mont Chery at 1826m. 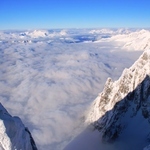 From here I take in the mountain panorama that’s going to be my constant backdrop over the next few days, although the clouds are stubbornly clinging to the top of Mont Blanc. 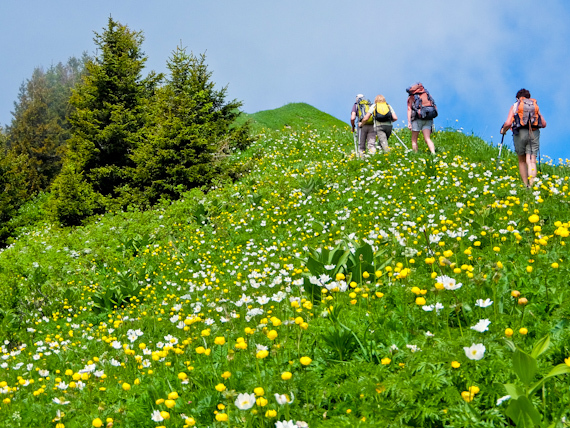 I descend through flower strewn meadows, then enter a forest before climbing slightly to the village of Montriond. The bonus of this hike is that you get to stay in pleasant hotels every night, rather than mountain huts, and I’m soon settling down to a beer in Les Sapins, on the edge of Lac Montriond. This will be my base for two nights, and the next day I take a circular route via the Ardent Waterfalls up to the bustling village of Les Lindarets and then along the Super-Morzine ridge before a long descent, edging through forest to Montriond and then back to hotel. Spring seems to be late this year and hills are running riot with wildflowers. Apparently Chablais has more than a thousand species including gentian, orchids and edelweiss and they all seem to be out at the same time. I leave the Hotel Les Sapins and start to climb above the lake, pacing myself as this is going to be my toughest day. I’ve the option of conquering the highest peak in the region, Mont de Grange, at 2432m, although it’s a diversion off the main route. As I approach, the ascent looks extremely daunting and there are patches of snow on the upper slopes. I reason that I can always turn back if it gets too tough but am determined to make it. It’s real slog upwards but finally I negotiate my way across the snow fields and reach the summit. I’m rewarded with an amazing Alpine panorama, looking as far as Italy and central Switzerland and Mont Blanc is suddenly clear of clouds. 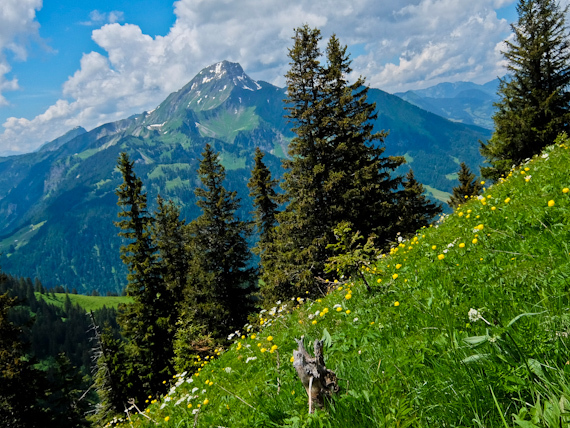 The mountain is also a wildlife sanctuary and home to around 500 chamois, along with mouflons and red deer. On my way down I’m rewarded by the sighting of a lone chamois, motionless on the snow. 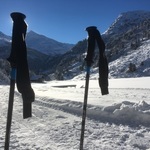 After I rejoin the main path, it’s another three hours down to the village of Chatel, but fortunately Rob, the UK owner of Hotel Le Renard is there to welcome me with a cold beer. He also makes an excellent dinner. 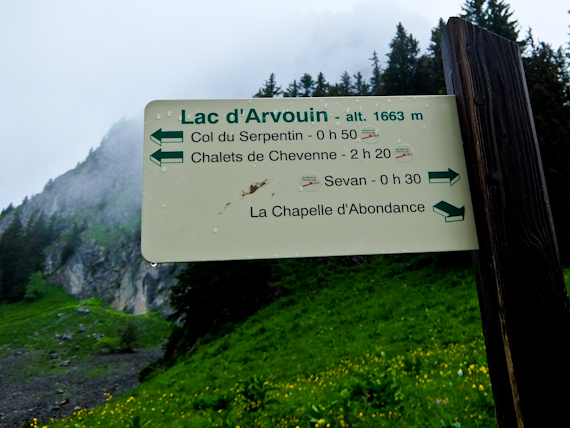 So far I’ve been blessed with warm sunny days, but the clouds are gathering as I set off for La Chapelle d’Abondance. 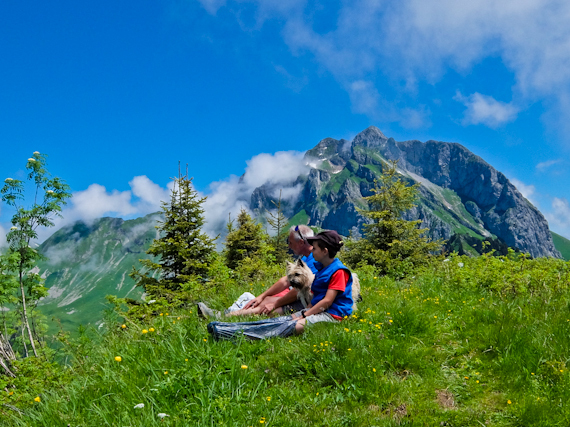 Most days there’s the easy option of catching a cable car to gain height, but I prefer to walk up to Le Morclan, just short of 2000m. 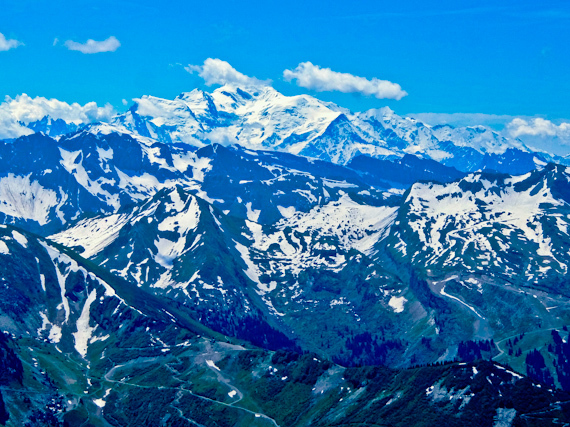 Dominating the skyline are the jagged teeth of the Dents du Midi, with Mont Blanc to the south and a sweeping view east of the Bernese Alps in Switzerland. Below I look across Lake Geneva to the town of Montreux and the path follows an old smugglers route running the length of the Swiss border. It’s then down through lush Alpine meadows thick with campanula, daisies and gentian to the pretty village of La Chapelle d’Abondance. I wake the next day to pouring rain, with the clouds sitting low in the valley. I’d been looking forward to conquering the Cornettes de Bise, at 2432m the same height as Mont de Grange, but the weather is against it. I don my wet weather gear and content myself with reaching the secluded Lac d’Arvouin, completely surrounded by mist. I take a different way down and there’s a dodgy section with chains, tricky in the wet, but I survive. 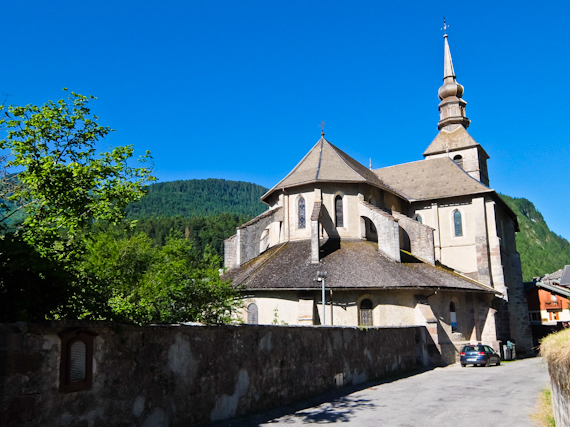 Fortunately the sun is back for my final few days and I spend a couple of nights in the abbey village of Abondance, enjoying its tasty cheese, before my last hike to St Jean d’Aulps. I’m now feeling slightly pleased with myself, having fulfilled my quota of walking with no ill effects – even my feet are healthy. All is going well, until I suddenly find my way to Lac de Tavaneuse is blocked, with a sign saying closed because of a landslip. I consult my map and see I can head for Passage de Savolaire, directly upwards. Unfortunately my notes say that the ascent is “steep and technical” and “only do it if you really have to”. Now there is an easier way but it means retracing some of my steps, and I’m worried about the rain. As I’m mulling the options, another hiker passes me and presses on ahead, so I reason it must be OK.
Later, as I’m reduced to struggling up the steep slope on my hands and knees, he shouts directions to keep me on the path. It’s demeaning and I slightly lose my nerve but as I finally reach the ridge, I realise I’ve overestimated my abilities. It’s all downhill from here and my transfer is waiting for me in St Jean d’Aulps. I keep quiet about the day’s foolhardy adventure – after all what happens on the mountains stays on the mountains. 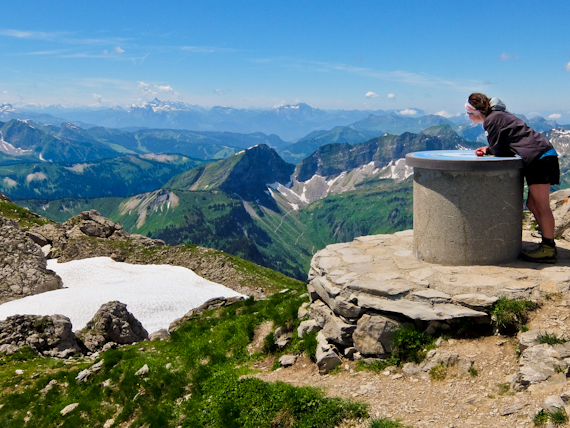 Headwater’s 10-night High Alps Walk is classified as 3-boot (“challenging”) and has departures every 2 days from mid-June to mid-September. Prices start from £928 (tour only) or £1178 (air with return BA flights from Heathrow to Geneva, and onward 60 minute private transfer). Included are 10 nights’ half board accommodation, luggage transfers, detailed maps and meticulous walking route notes, and 24/7 support from Headwater both in UK and overseas.